Russia-backed separatist forces 25 times attacked ATO positions in eastern Ukraine last day, a tripple decrease over the previous day, the press center of the Anti-Terrorist Operation said on 1 September. The enemy made 14 attacks in the Donetsk sector, ten in the Mariupol sector and one in the Luhansk sector. The militants fired 120mm mortars on the Ukrainian positions in Avdiyivka, the Donetsk sector,. The militants fired automatic mounted grenade launchers, heavy machine guns and small arms on Avdiyivka, and fired small arms on the Ukrainian positions in the village of Verkhniotoretske. Militants fired automatic mounted and rocket-propelled grenade launchers on the village of Zaitseve. A sniper was also active there. Read also Russian proxies attack Ukraine 75 times last day. In the Mariupol sector, the enemy fired small arms outside Maryinka, Novotroyitske, Starohnativka and Bohdanivka. They also fired 82mm mortars on Starohnativka, as well as automatic tank grenade launchers on Pavlopil. In the village of Shyrokyne, the Russia-backed militants used fired machine guns and small arms. A sniper was also active there. 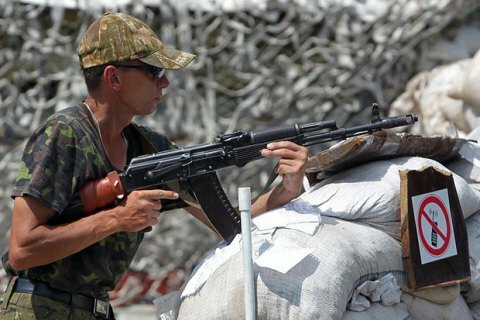 In Luhansk region, the enemy fired small arms on the village of Stanytsia Luhanska," the press center reported. The previous meeting of the contact group in Minsk agreed on a ceasefire from midnight August 31 in connection with the start of the new school year. However, as the truce failed, the Ukrainian side has initiated an urgent Skype conference on 1 September.